Don't miss the chance to play three of the most famous golf courses in the world! Golf Ayrshire can provide a package for you to have a truly memorable experience on these British Open Championship courses. 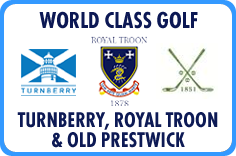 Although Old Prestwick is not a current Open venue, it is renowned as the first ever course to host the British Open Championship. Please email us for further package details.